The Twin Sample Biopsy Needle harvests two tissue samples in one pass, one for conventional pathology and the second for molecular diagnosis. If the pathologist finds tumor tissue in the first biopsy, the second sample can be dissected to provide matching tissue for testing in the molecular assay. 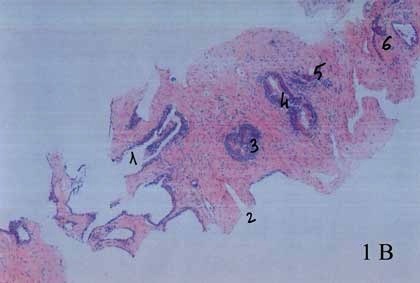 Slides from twin samples of fresh ex-vivo prostate. One sample satisfies pathology and ethical requirements for patient treatment, leaving the second available for molecular assays. Since the second mirrors the first, the pathologist’s findings tell you what is in the second sample. Get the Right Sample for precision medicine. The fresh sample is sent from the biopsy procedure directly to the extraction lab to provide analyte for everyone. No more tracking a single biopsy, multiple blind biopsies or finding the remaining block inadequate. In this way getting accurate results – without contradictions – can become routine. See The right tissue samples for precision medicine – a proposal paper below. Introduction and the current situation: Precision medicine depends on tissue samples to determine DNA, RNA and protein characteristics of tumors and other tissue. We present an ideal scenario for tissue acquisition, handling and processing that may satisfy all parties. We have developed the scenario following discussions with interventional radiologists, laboratory personnel, study directors and others involved in precision medicine. We call this solution the “Right Sample,” as it satisfies the requirements of precision medicine. 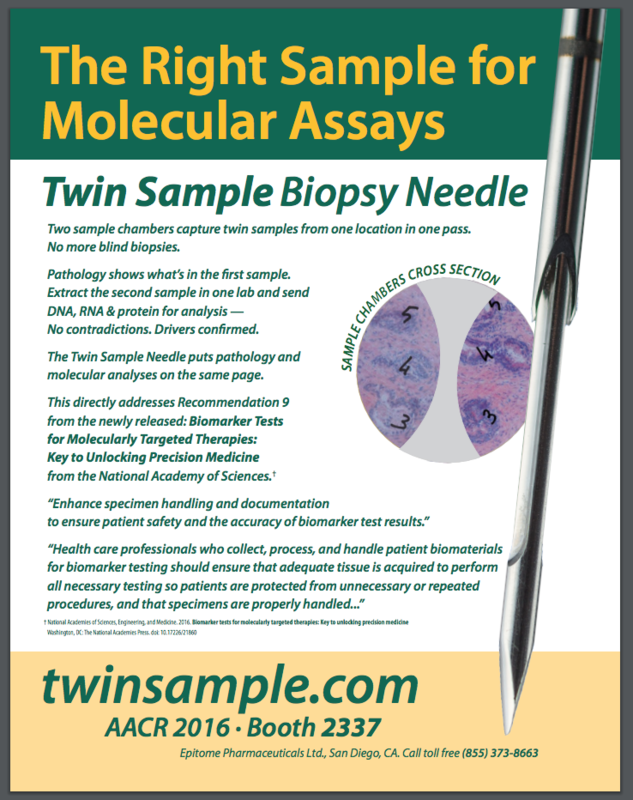 The Twin Sample biopsy needle obtains two samples in one pass; one for pathology and one for molecular assays. The two samples share a surface, as the two halves of a cylinder of tissue about one mm across. The pathology report informs the molecular analysis, since the percentage tumor cells affects the depth of coverage of sequencing. Today interventional radiologists are asked to obtain up to 8 separate samples from the same tumor, but these blind biopsy samples are not the same as the first sample which goes to pathology. We know little about them. They are preserved in different ways, go to different departments and are extracted by different people on different machinery and reagents. Results may not be comparable and conflicting results add to the confusion of genomic medicine. The Best Practices recommended by the NCI for biospecimens starts with the sentence: “The aim of every biospecimen resource should be to collect, maintain, and disseminate the highest quality biospecimens, based on the intended research use.”1 The mantra for diagnostics practice methodology is “fit for purpose,” so that the specimen is collected and handled to provide a reproducible and informative diagnosis. These methods need to be validated as “fit for purpose” and then standardized to ensure comparability. The Right Sample: One sample is best, especially if many tests are contemplated, to reduce between-sample variance. One sample of fresh tissue is sufficient for all tests contemplated in precision medicine. This sample is then processed in one laboratory, the DNA, RNA and protein tested for quality once, aliquoted and distributed to multiple laboratories, along with the findings from the pathology report. A typical biopsy sample of 3 to 5 mg of fresh frozen tissue will yield between 3 to 5 ¬µg of both DNA and total RNA, more than enough to perform several assays. Testing may involve a series of assays; is there enough DNA and RNA remaining to perform these additional tests? In this ideal scenario, no further biopsies will be needed. Everyone would be testing the same sample which has been characterized and processed properly. For targeted treatment, the patient's fate rests on the quality of this sample and its analysis, which changes the risk-benefit assessment. The right biopsy: The Twin Sample biopsy needle delivers two matched samples in one pass. Only one good pass is needed. One of the two samples, for molecular analysis, should be processed immediately while the second sample, for pathology, receives Rapid On-Site Assessment (ROSE). If this sample is adequate, the procedure is complete; if it is inadequate, the biopsy is repeated. Sometimes the tumor cannot be sampled properly with a cutting needle, such as if it is lytic or necrotic. Other strategies may be implemented at that point. A short 14G introducer needle is useful for use with the Twin Sample biopsy needle, so that a pneumothorax can be aspirated, a clotting substance delivered or to prevent tumor seeding. Because one pass will suffice for most procedures, the introducer does not have to be placed all the way to the tumor. The Twin Sample needle has ultrasound markings and obtaining a sample under ultrasound guidance is a classic procedure for accessible tumors. Recently the NCI-MATCH trial reported that 13% of biopsy samples were inadequate for testing when received at the central laboratory, despite the explicit instructions for taking biopsies.3 This trial called for four blind biopsies per tumor, and some centers were not delivering sufficient biopsies, as well as that some biopsies were inadequate for testing, primarily because they did not contain tumor tissue. The question of whether the blind biopsies gave conflicting results was not addressed in the summary of the trial pause. Technology like the Twin Sample biopsy needle and better transport media for fresh tissue have a role to play in obtaining and testing the Right Sample, but they cannot replace teamwork, SOP's and standards. Getting the Right Sample deserves the full attention of the team and the institution, as the purpose of precision medicine can only be accomplished using the Right Sample. Considering the time and expense of the workup it will receive, and the interests of the patient, the Right Sample deserves that attention. We hope this new approach will bring a new attitude and better quality tissue needed for precision medicine. We hope it will reduce the load on the interventional radiologist, on the lab processing the tissue and on the researchers running molecular assays and trying to explain variance when they have in fact been testing different samples. It will probably reduce cost and increase throughput for these specialties. I look forward to hearing from you and want input on this approach. 1 http://biospecimens.cancer.gov/bestpractices/to/bcpsrd.asp accessed 23 March 2016. Core needle biopsy is a safe procedure, with very few severe complications. The doctor administering the biopsy has to balance sample adequacy versus the complication rate when choosing which needle size to use. Larger needles produce better samples with fewer passes. However, larger needles also produce more bleeding in blood rich organs such as kidney or liver. We undertook this study because the Twin Sample biopsy needle is 16G in size to produce two samples comparable to an 18G biopsy needle. In discussion with interventional radiologists, they expressed concern that the larger gauge would lead to greater complication rates. PTW: The Twin Sample biopsy needle takes two samples in one pass. We call them Twin Samples because they share the inner surface. The needle captures a 1 mm wide strip of tissue which is split down the middle by the spear blade at the tip. 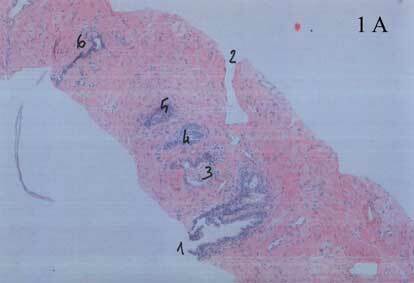 PTW: One sample goes to pathology and they can make slides and look at it. The pathology report tells you what is in the second sample, which is used for molecular analysis. Especially for precision medicine, you need to know what percent of the sample is tumor cells, because that determines the actual depth of coverage of tumor DNA in NGS. How is it different from what is happening today? PTW: Today the interventional radiologist takes a first sample for pathology, and that sample may be checked for tumor cells right in the biopsy suite. Then he re-inserts the biopsy needle and takes more samples for molecular analysis, sometimes as many as 8. Each of these blind biopsies is from a different place in the tumor, and some may not have any tumor at all, especially for smaller tumors. So we can reduce this between-sample variance, make sure everyone is testing one well-characterized sample. How do you make sure everyone is testing the same sample? PTW: We cannot control that part; all we can do is provide one good Twin Sample. We suggest that sample be processed in one lab into its DNA, RNA and protein. The quality can be checked there as well. Then the analytes are aliquoted and sent to the different labs for their analysis. If they are getting 8 samples now, how can you provide enough analyte for 8 tests? PTW: Fresh tissue has a lot more and better quality DNA and RNA than people may expect. A typical 3 mg slice would provide 3 micrograms each of DNA and RNA, enough for 6 aliquots of 500 ng each. How were you inspired to invent the Twin Sample biopsy needle? Saverio Bettuzzi and I were discussing his mRNA assay for prognosis of prostate cancer, in the courtyard of Fontanello, actually, a castle near Parma. There was no way he could do the assay on biopsy tissue, because there wasn't enough mRNA left after the formalin processing and cutting in pathology. So I said we had to have two samples from the biopsy, and the idea was born. As usual, it took years to perfect the instrument, but now it is in the market, fully approved and available. What are your hopes for the product? I want the biopsy procedure to be simpler and easier on the patients, especially children. This needle is a very precise instrument and designed to be used with ultrasound. We could go back to the days when one pass was enough and the procedure takes a minute. Operates like a conventional biopsy needle – no training needed. Manufactured for Epitome Pharmaceuticals to the highest quality standards by Kaneko MediX in Japan. Actuators, packaging, sterilization, and worldwide distribution are provided by Gallini Medical Devices of Italy. Patent issued in Japan. Patent pending in USA and European Union. Manufactured for Epitome Pharmaceuticals to the highest standards by Kaneko MediX in Japan. Actuators, packaging, sterilization, and worldwide distribution are provided by Gallini Medical Devices of Italy. FDA 510(k) and CE Mark, December 2013. Patent issued in Japan. Patent pending in USA and European Union.